Runners, swimmers and cyclists alike can benefit from wearing a fitness band. We’ve rounded up our favourites from Fitbit, Apple, Garmin and more to find the best activity tracker for you. There was a time where the word ‘Fitbit’ was synonymous with any and all fitness trackers, but now there are plenty of contenders for the throne, from waterproof wearables for keeping track of your progress in the pool to smart fitness watches that double up as communication devices. This is great news if you’ve never been sure about the whole fitness band phenomenon before — with many different variations on the theme popping up on the market, you’re far more likely to find exactly what you’re looking for. However, it can spell bad news if more choice for you means more weighing up, more browser tabs open, more frantic scribbling and muttering as you compare prices and features. Well we’re here to help. Buying a fitness tracker needn’t be nightmarish, as our round-up of our favourite options proves. The best fitness trackers are chock full of sensors measuring everything from sleep to stairs climbed, so if you’re serious about building up a big picture of your health and fitness, it’s worth shelling out a little extra. When it comes to finding fitness trackers on a budget, look to GPS giants Garmin and TomTom for the basics, done well. Generally speaking, if you’ve already aligned yourself to a brand with your mobile phone or another device, you’d be best placed to stick with it. Put simply, the best fitness trackers for iPhone will probably be Apple Watches, while the best fitness trackers for Android will be from OS-allied tech brands like Samsung. Other than that, it’s down to your personal choice of style and budget. Steps, heart rate, distance covered, calories burned, floors climbed… The Fitbit Charge 2 really does track your every move, and that’s what we love about it. If you’re looking to get fit and want to be held accountable for absolutely every aspect of your journey, this is a great place to start. Get real-time stats, see summaries in the app, and more thanks to GPS and Bluetooth. Plus, the integrated screen makes the whole thing sleek and discreet. Right now, we think this is the best fitness tracker money can buy. There’s only one caveat: its lack of proper waterproofing. Head elsewhere if your main exercise is swimming, but otherwise, go for this. If you’re constantly flitting from sport to sport, the TomTom Spark 3 is the activity tracker for you. Indoor training mode, race mode, route exploration and more give you lots of different ways to monitor your workout, whether you’re hitting the treadmill or the open road, while the water-resistant construction makes it great for swimming, too. If you enjoy listening to music while you work out (let’s be real, who doesn’t?) its storage for 500 songs and wireless headphone pairing are sure to be a plus, although the sound quality isn’t the best. Overall, a top option for the person who’s always on the go. Unlike the other smartwatch on our list, the wristwatch-style Samsung Gear S3, the Apple Watch’s design sits somewhere between smart and sporty — it’s engineered to be tough but beautiful, with Ion-X strengthened glass and water resistance to 50 metres, a sleek Space Grey case and lucid screen. Like the Series 2, it focuses on three main ‘rings’ of activity, but adds in an altimeter to track all the stairs you’ve tackled throughout the day, and while it has the edge on the Fitbit for its more phone-like features, and as much as we love the idea of its intuitive Reminders to Move, to justify the extra expense you might want to use it as more than just a fitness tracker. At under £100, this Garmin fitness tracker is a superbly affordable option. With a slimline band and neat, flush integrated screen sort of reminiscent of the Fitbit, it’s discreet enough to wear any time, which is good news if you’re keen to use the 24/7 heart rate monitoring. It measures all sorts of activities automatically, like swimming, cycling and elliptical training, and through measuring your heart rate (and therefore your heart rate variability) it can even tell you your stress level so that you know when to chill out. If we were to find one negative, it would be in the reports from reviewers that it can be difficult to pair with phones, so if you’re a technophobe, perhaps consider something more user-friendly. If you’re looking for a fitness tracker that doesn’t look like a fitness tracker, this stealthy smart watch has you covered. While to all appearances a regular watch (and a handsome one at that) it makes calls, takes texts and plays music as well as tracking heart rate, calories burned, and more, so it’s also worth considering if you want a smartwatch that doubles as a fitness tracker, rather than shell out for a dedicated product. If you have other Android devices, we recommend this over the Apple Watch purely for the smooth pairing. We’ll square with you: it’s not the most beautiful-looking thing in the world, even with its great range of colours, and especially when compared to the Fitbit Charge. But what the Moov Now band lacks in looks, it more than makes up for in functionality. A little like having a 24-hour personal trainer (but less expensive, and annoying), it tracks your progress and motivates you, through its real-time audio coaching function, to reach your fitness goals. Lightweight, breathable and totally waterproof, it’s also one of the best fitness trackers for swimming, setting it apart from many other wearables. Exercisers with a cardiovascular disorder, or anyone who likes to keep an eye on their heart health, would do well to give POLAR’s heart rate strap a try. 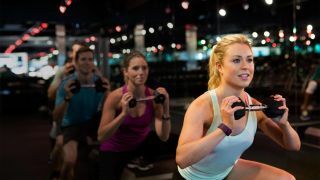 Monitoring heart rate with what the company promises is maximum precision, it connects your heart rate to your workout for a visual on how you’re progressing with your cardio regime, tracking both with the band’s built-in memory and on compatible gym equipment. Perhaps most importantly, users have found it comfortable to wear, although some struggled a little with the buckle fastening. A smart bathroom scale, whatever next? It’s not as gimmicky as it sounds though. In fact, it’s really rather good. Rather than have to worry about wearing your fitness band every hour of the day, you can make stepping onto the scales part of your morning routine, and they’ll track and give you instant feedback on your weight, body fat, water percentage, and even muscle and bone mass. It also has the edge over bands for being multiple-user-friendly, with up to eight users having the ability to keep track of their weight history. If you’re looking for an activity tracker that’ll count every step, this isn’t the one for you, but if you’d like a picture of your overall health that the whole family can use, give it a whirl. Enticed by the concept of the Nokia Body+ but want to see your options? We’ve rounded up the best bathroom scales, including some smart options, right here.